A poly(β-Cyclodextrin)/bentonite composite (β-CD/BNC) were characterized by N2–BET measurement, scanning electron microscopy, energy dispersive spectrometer, fourier transform infrared spectroscopy, thermogravimetric analysis and X-ray photoelectron spectroscopy. Its synthesis mechanism of graft polymerisation was expounded. The maximum sorption capacities of Cs+ onto β-CD/BNC in absence and presence of Cl− and CO32− were 48.83 mg g−1, 48.90 mg g−1, and 46.19 mg g−1, respectively. The effect of Cl− and CO32− on Cs+ adsorption was not obvious. β-CD/BNC displayed good stability and reusability. 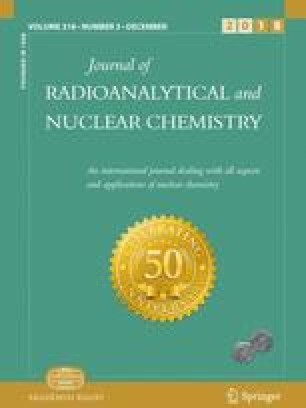 The main adsorption mechanism of cesium by β-CD/BNC was ion exchange, and the surface coordination was subordinated mechanism. This work was financially supported by the Hunan Natural Science Foundation (2018JJ3420), the National Natural Science Foundation of China (11475080), the Graduate Student Research Innovation Project of Hunan Province (CX2016B427).